Absentia is returning to Amazon. Today, the streaming service announced they’ve picked up the TV show for a second season. The thriller drama, which airs on Amazon in the U.S., centers on an FBI agent who is found in a cabin in the woods years after mysteriously disappearing. Stana Katic, Patrick Heusinger, Cara Theobold, Neil Jackson, Angel Bonanni, Richard Brake, Ralph Ineson, Paul Freeman, Bruno Bichir, and Patrick McAuley star. Season two of Absentia is slated to debut on Amazon in 2019. 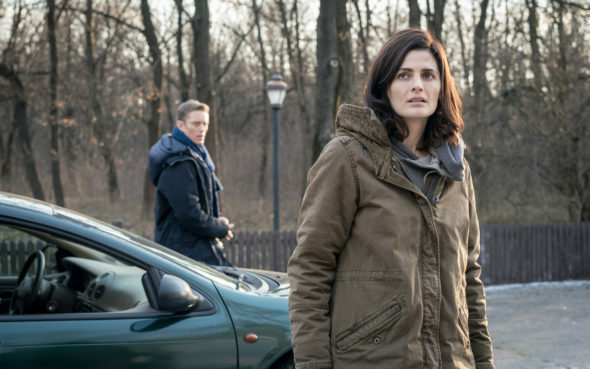 Amazon today announced that it has picked up binge-worthy thriller Absentia for a second season, to debut in 2019 exclusively on Prime Video in the U.S., as well as in select markets globally, including Australia, Austria, Germany, India, Israel, Italy, Netherlands, Singapore, South Korea, Turkey and the U.K. Currently in production in Sofia, Bulgaria, Absentia was commissioned for Sony Pictures Television’s international networks, is produced by Masha Productions and distributed by Sony Pictures Television. Absentia, starring and executive produced by Castle’s Stana Katic, centers on FBI agent Emily Byrne (Katic). In season one, Emily disappeared without a trace and was declared dead after hunting one of Boston’s most notorious serial killers. Six years later, Emily was found in a cabin in the woods, barely alive, and with no memory of the years she was missing. Returning home to learn her husband had remarried and her son was being raised by another woman, she soon found herself implicated in a new series of murders. In season two, after tracking down and killing her abductor, Emily struggles for a tenuous new normal with son Flynn and ex-husband Nick. But her obsessive investigation into the questions that haunt her uncovers a serial killer and a spiraling conspiracy that threatens more than just her family. New cast members joining season two include Matthew Le Nevez (The Widow) and Natasha Little (The Night Manager). Le Nevez will portray the character Cal Isaac, a rugged ex-Navy SEAL with a disarmingly upbeat disposition. Cal’s familiar with the demons that chase Emily (Katic) and proves to be a loyal and sympathetic counterpart to the series heroine. Little will portray the character of Special Agent Julianne Gunnarsen, an accomplished, enigmatic and beautiful FBI Profiler with a chilly efficiency who joins the ranks of the Boston FBI Field Office after a deadly terrorist attack rocks the city. Patrick Heusinger returns for season two as Emily’s ex-husband and Special Agent Nick Durand. In addition to Katic, Heusinger, Le Nevez and Little, Absentia’s internationally renowned ensemble cast includes Cara Theobold (Downton Abbey), Neil Jackson (Sleepy Hollow), Angel Bonanni (False Flag), Paul Freeman (The Dogs of War) and Patrick McAuley (The Conjuring 2). What do you think? Have you seen Absentia? Will you watch season two? More about: Absentia, Absentia: canceled or renewed?, Amazon TV shows: canceled or renewed? I liked season one and stana is great. I love her and her acting. Why isn’t available for canadian viewers on cable tv? I’m sorry Stana I hate writing this because I’ve really enjoyed your previous work, but Absentia? I found series one to be completely bewildering with Stana/Emily being placed in ever increasingly and unbelievably stupid situations surrounded by actors who seemed unsure of what they were doing there. Drama? No just dumb. I was praying that there wouldn’t be a second series because I’ll have to watch it for Stana’s sake. PLEASE don’t do a third! Was it that bad because I was planning on watching it because of Stana? Watch it. It’s actually good.